Waterloo Bar and Kitchen had an old sort of feel to it. 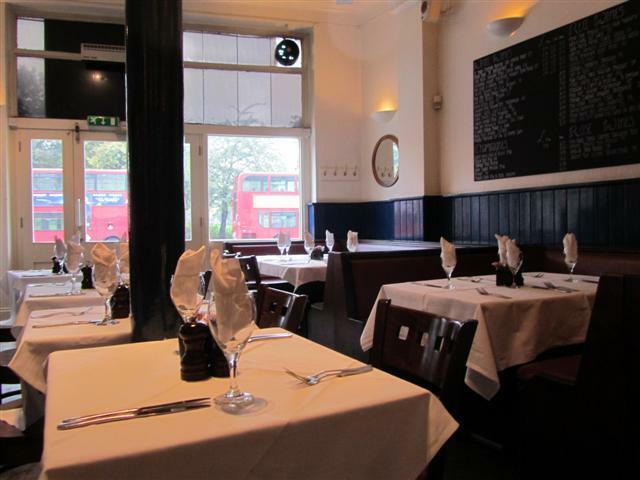 Its dark wooden furniture, black panelled walls and some booth cushioned seating made up the dining area. The back of the restaurant is where the open kitchen was. There is always something good about being able to see the food being prepared and made. There was also a small bar area. There was a good range of food on the menu. 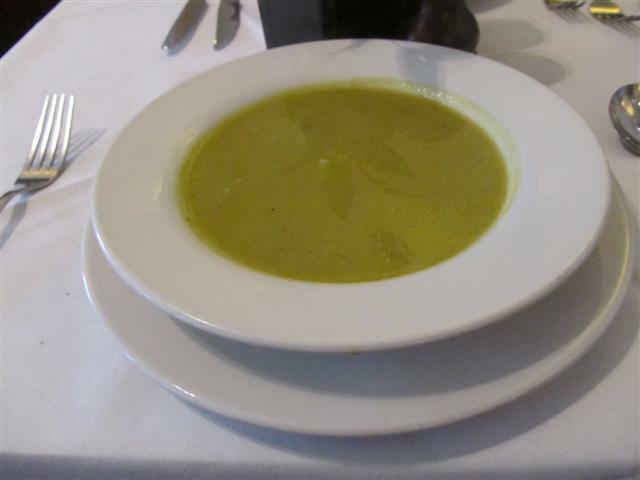 As it was a cold day, it felt like the meal should be started off with soup. The soup of the day was Vegetable Soup. It was a fairly big bowl of soup and I couldn’t finish it all. The soup was tasty but was also spicy. I am not sure if it was due to chilli or pepper. For the main lunch, the Pan Roasted Halibut was great. 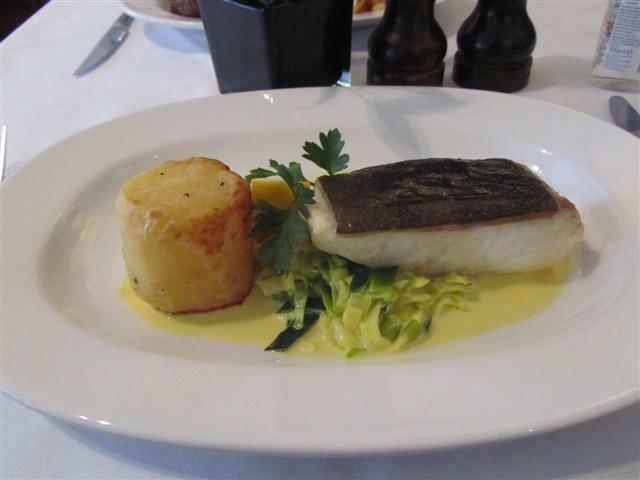 It was served with fondant potato and saffron creamed leeks. The halibut was soft and moist. It would have been better if the skin had been crispy. The fondant potato was just the right amount of potato for the dish. The saffron flavour really came through in the sauce of the leeks. My friend had the Squid and Chorizo Salad with chilli, garlic and coriander dressing. He was happy with how the squid was cooked. It was tender and not rubbery. The only thing was that the squid was bland. This was because all of the dressing for the salad was on the bottom of the plate. It felt like the dressing had been put into the bowl, then the salad leaves and then the squid and chorizo. Basically, the dressing had not been mixed with the salad items. 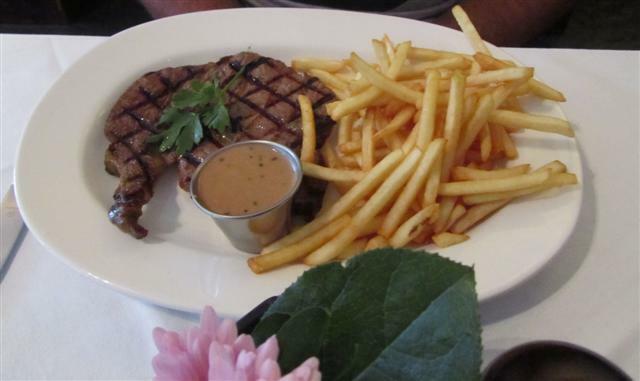 The Chargrilled Rib-Eye Steak that my friend had was a good meal. The meat had been cooked as he had wanted it. It came with fries and a little pot of peppercorn sauce. Although the starters at Waterloo Bar and Kitchen were not up to scratch, the main dishes and the desserts certainly made up for it. Talking of desserts, my friend suggested that we should complete our meal with this. It is always difficult for me to choose something else whenever I see Fruit Crumble and Custard on the menu. But I resisted this time and decided to try the Pear and Frangipane Tart. This was a lovely dessert. 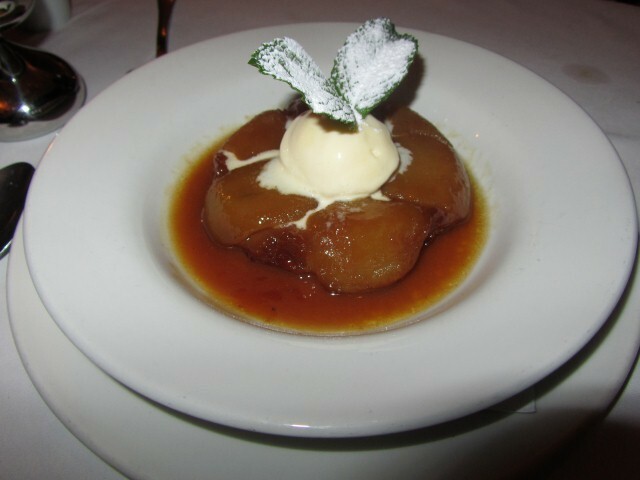 A slice of warm almondy pie with pear served with vanilla ice cream. It was a yummy dessert and hit the spot just right. 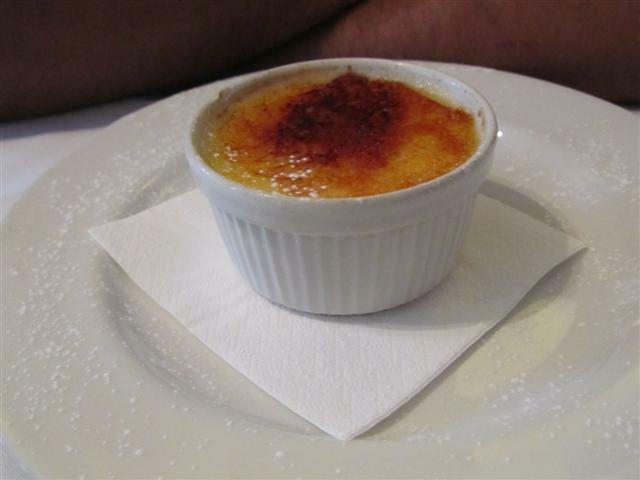 The dessert on the specials board was Orange Creme Brulee and my friend chose this. It had the classic caramelised top and a creamy filling. My friend was happy with this dessert. 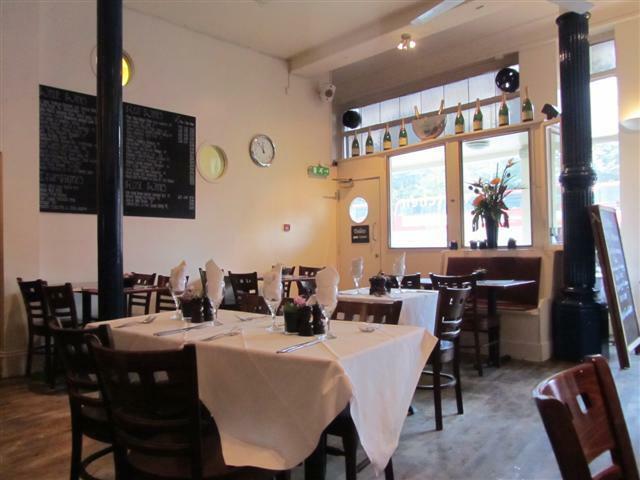 The staff were really great, friendly and very attentive. At every stage of our meal, they did ask if everything was okay. Even though I had only stated some dietary requirements on my starter, the staff checked with me if the ingredients in all my other dishes were okay with me. This was done without me asking and he also checked things again with the chef. The service at Waterloo Bar and Kitchen felt very personal. At the end of the meal, the staff asked us if we had enjoyed the food. It was nice that when we mentioned the couple of points about the dishes, he took note and said that he would pass our comments onto the kitchen. 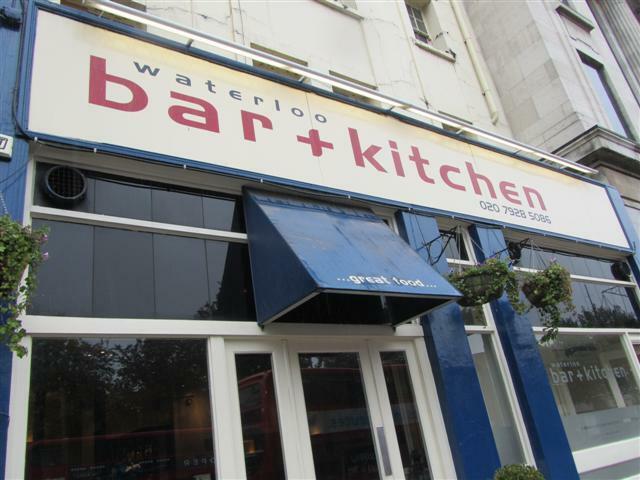 Recently, Waterloo Bar and Kitchen was revisited. 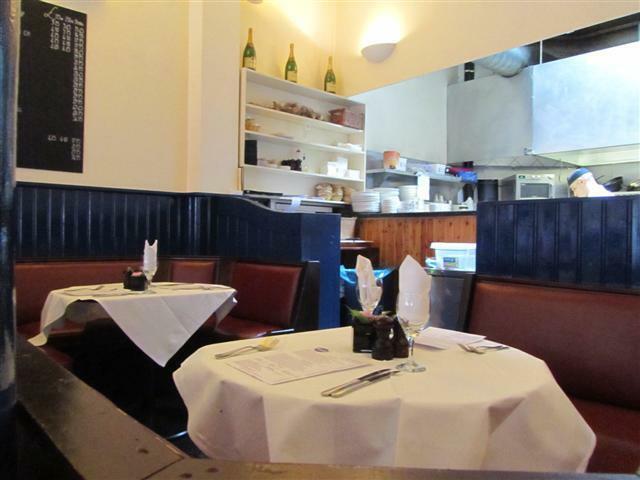 Waterloo Bar and Kitchen is only a couple of minutes away from the Old Vic Theatre which makes it an ideal restaurant for theatre goers. 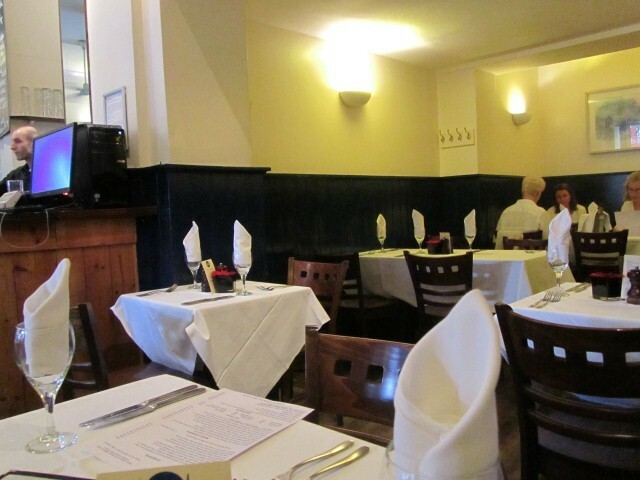 On this particular evening, the restaurant was extremely busy with a lot of customers dining here before heading to the theatre. When we were seated at the table, the staff asked straightaway whether we would be going to the theatre tonight so that they could make sure that we were not delayed for the show. This time it was all about sampling the specials on the menu! While we decided on our order, we were given olive bread with a lovely tangy yet sweet dipping sauce. Two starters were chosen, one from the normal menu and one was the special. 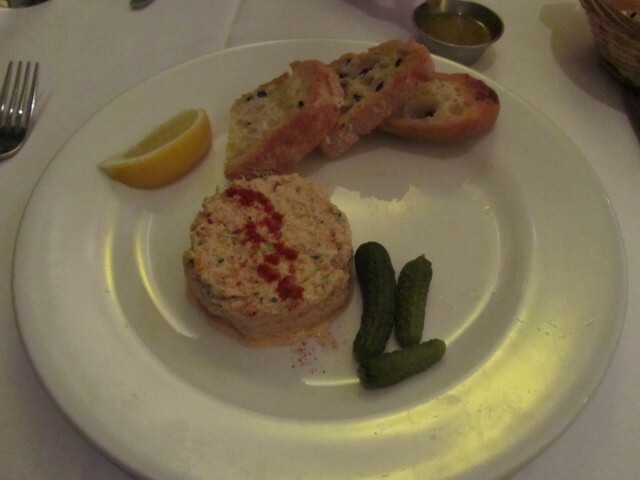 The special of Crab Mayonnaise came with pickled gherkins and toasted ciabatta and it made a nice start to the meal. The Wild Mushroom Risotto was topped with parmesan shavings. 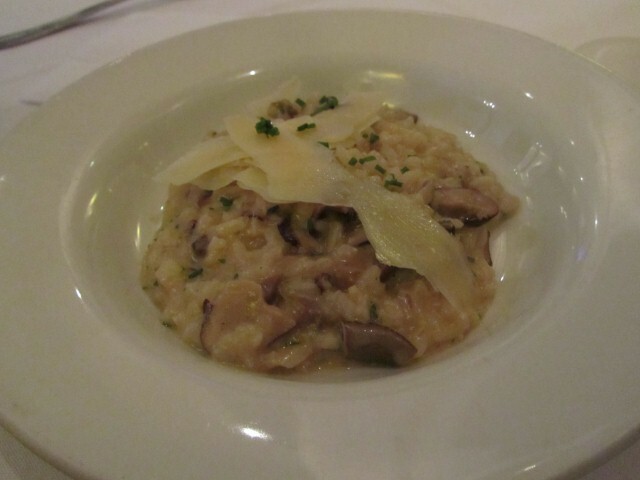 The risotto had a good intense mushroom flavour especially with the white truffle oil. Onto the main courses for the evening, two were fish based and one a vegetarian dish. 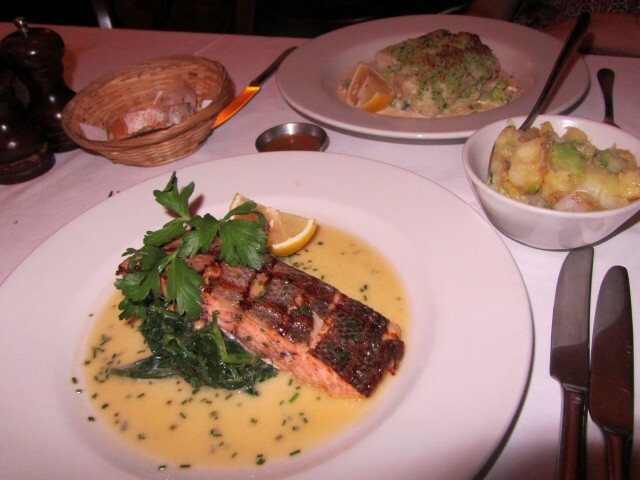 The special this time round was Grilled Scottish Salmon Fillet with Melted Leek and Crushed Potatoes with Bois Boudran Sauce. I liked the sound of this dish but wasn’t too sure if the Bois Boudran sauce would be something that I would enjoy. Not feeling too adventurous this time round, I asked the waiter if the sauce could be replaced. It was great as he just said that I could chose whatever sauce I liked and the chef would make it for me. There were a few things I ended up requesting: a lemon butter sauce, some spinach and the leek and potatoes as a side dish. The whole dish was delicious and it all came well together. The salmon fillet was grilled to perfection with a crispy skin. There was plenty of lemon butter sauce and spinach. The potatoes and leeks had a good creaminess to them. 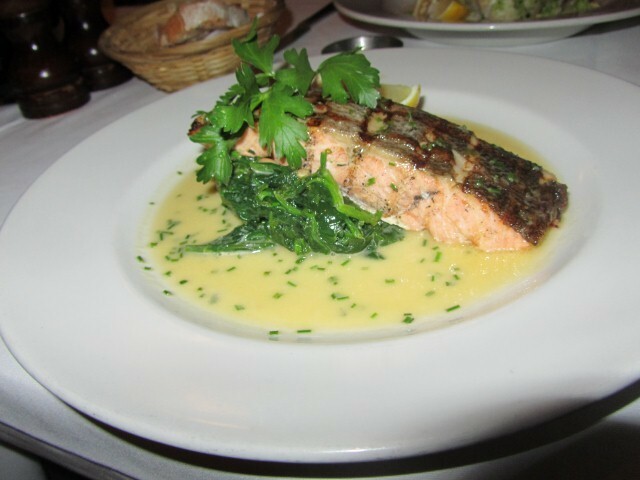 The salmon special was a popular one with diners that evening, as by the time we had finished our mains, the salmon was taken off the specials and replaced with sea bass! 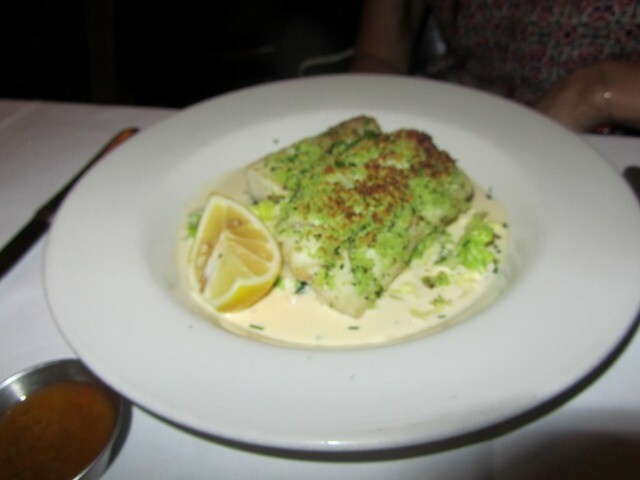 The other seafood dish was the Roast Herb Crusted Cod Fillet with Braised Savoy Cabbage, Spinach and Lemon Butter Sauce. There were two fillets of the cod served with a lemon wedge. The cod was nice enough but not as striking as the salmon fillet. Both of the fish dishes were fairly big portions and were extremely filling. 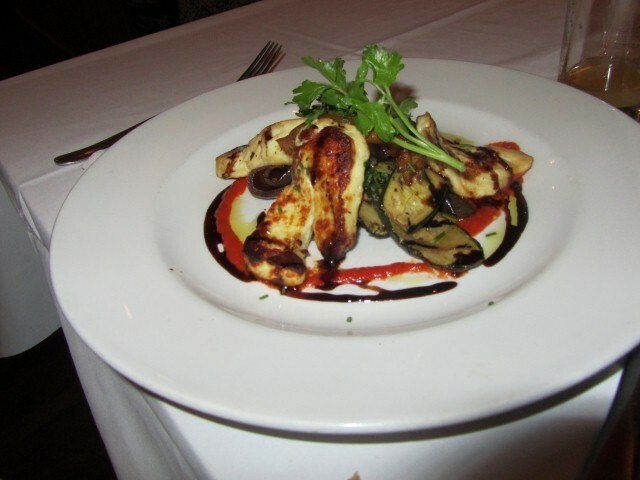 The Pan Fried Halloumi with Char-Grilled Mediterranean Vegetables was presented well and was pretty to the eye! It was drizzled with a fresh tomato coulis. There was plenty of the halloumi and together with the selection of vegetables, it made for a satisfying and tasty dish. 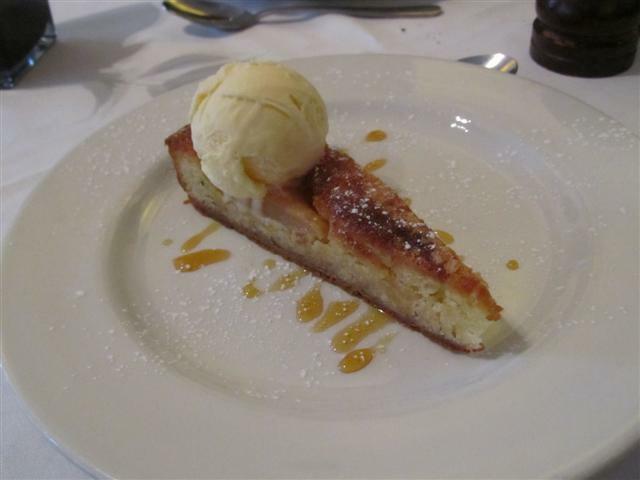 For dessert, we again went for the special of the day which was Tarte Tartin. Rich butterscotch sauce together with the soft caramelised apples, pastry and vanilla ice cream made for a wonderful dessert. 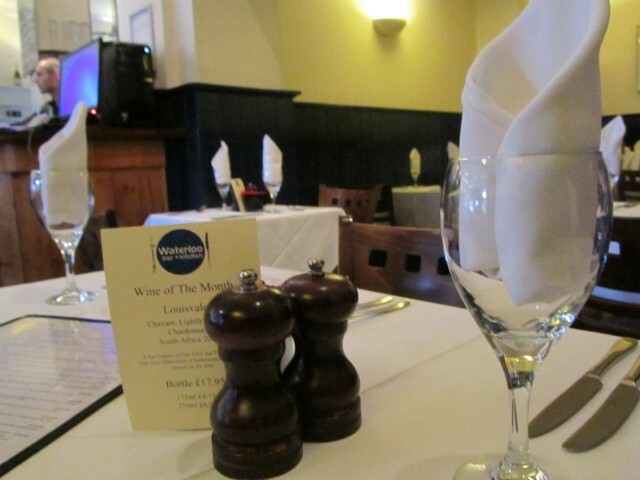 Our time at Waterloo Bar and Kitchen was greatly enjoyed and again we had great friendly service and delicious food.